Continuously improving and investing in the community are just a few of the things VEXXHOST and its employees stand behind. As such, we have a handful of exciting announcements that we have been hard at work on and fully believe reinforce our values as a company of quality and expertise. Recently VEXXHOST had the amazing opportunity to become members of The Linux Foundation, a well known and reputable organization founded in 2000 that is fully dedicated to the development and encouragement of open source projects and viable ecosystems. Joining as Silver members to such an integral foundation is an honour. VEXXHOST also had the chance to join the Cloud Native Computing Foundation (CNCF), a subsidiary of The Linux Foundation, as Silver members. The CNCF itself was brought into existence in 2015, and already boasts the container-orchestration platform of choice as its first project – Kubernetes. The opportunity to establish a membership with this instrumental organization has enabled VEXXHOST to support and pursue its aims as a leading open source infrastructure service provider. 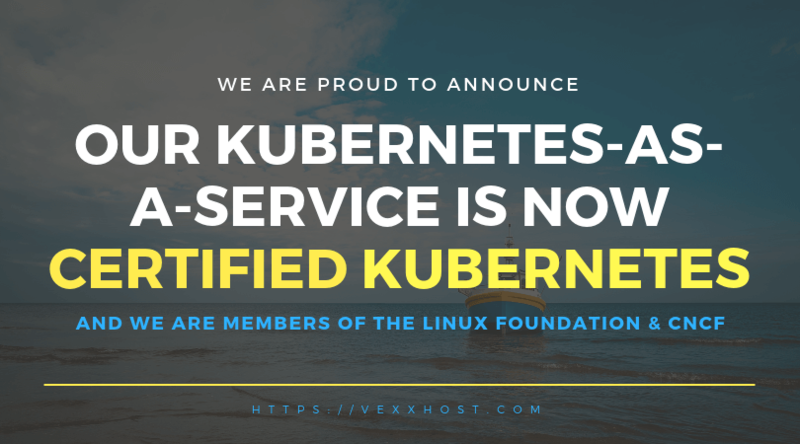 The VEXXHOST team is also proud to announce that our Kubernetes-as-a-service offering which runs on OpenStack’s Magnum has earned us the certification by the CNCF of Certified Kubernetes. Finally, VEXXHOST is proud to announce that we will be sponsoring Kubecon & CloudNativeCon North America 2018 as a Silver Sponsor. Events like Kubecon give open source communities access to leading experts and contributors in the Kubernetes arena, an opportunity that coincides with the overarching goal of distributing and sharing knowledge for the reason of technological advancement. Suffice to say, there are no downsides to supporting, sponsoring or attending so we hope to see you there! You can find us in booth number S73. We are truly excited about all of these opportunities and achievements here at VEXXHOST and we look forward to sharing more updates with you soon!